Every autumn garden center shelves fill with crates of tulip and daffodil bulbs. While these spring beauties are certainly delightful, the world of bulbs offers so much more. Why not try something new this season? The following bulbs offer a little something for every gardener, from dainty elegance to striking spectacle. For greatest visual impact, plant bulbs in clusters rather than a straight line. Adaptable to sun or shade, scilla produces a flush of vibrant blue flowers in early spring. Deer tend to leave this bulb alone, so you get to enjoy all the blossoms. Plant this purple giant for the “wow” factor. Ball-shaped flower clusters spanning 10 inches wide top three-foot stems in late spring and last well into summer. This graceful giant holds creamy pink flowers in clusters atop 2- to 3-foot tall stems. Flowers begin upright then tilt earthward as they open, attracting butterflies and bees. Appearing in late winter to early spring, the rich blue star-like flowers have a white center and form in dense clusters. A real charmer – plant them in drifts beneath taller spring-bloomers. Elegant salmon pink flowers with hints of orange soar above the garden for an eye-catching display. Flowers attract butterflies and are also excellent for cutting. Add a touch of the exotic! Distinctive red-orange bell-shaped flowers dangle beneath a crown of short leaves. Fritillaria bulbs need well-drained soil and lots of sun. Waves of delicate blossoms grace the spring garden in a rich violet-rose. Flowers rise above a low carpet of lacy foliage. Pure elegance. 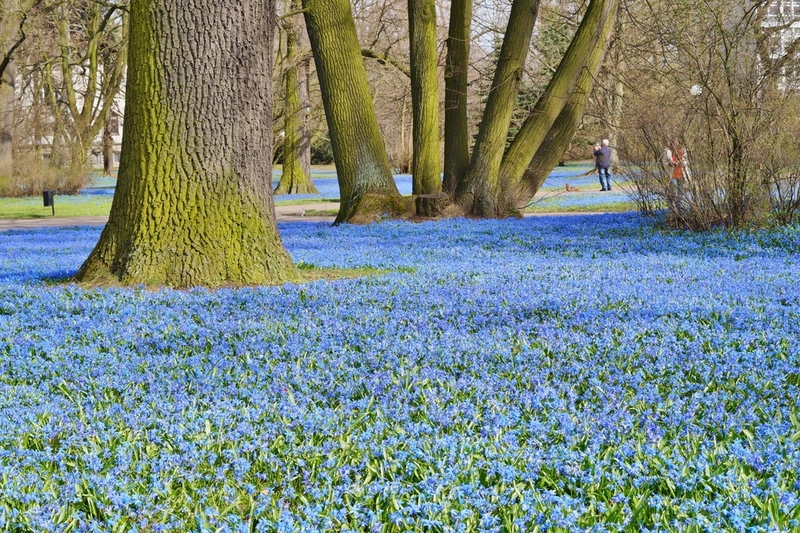 This little gem forms a carpet of blue flowers each spring. Perfect for naturalizing beneath a stand of daffodils. Tuck a few bulbs wherever you have space. Dainty bell-shaped flowers add whimsy to the garden with their unusual checkerboard markings. Flowering in shades of purple and white, plant in shade to part sun. Makes a graceful cut flower. Though fall-planted, this bulb blooms in late summer. Grassy foliage follows flowers and lasts all winter long. Plants can take time to establish, but the gorgeous blooms are worth the wait.